Q: Who owns Steam Whistle? A: Steam Whistle Brewing is independently owned by a group of private investors, comprised mostly of employees, family and friends collectively known as The Good Beer Folks. Q: How many bottles can Steam Whistle produce in a day? A: The average for one day is 88,000 on the production line. Q: What is the breakdown of sales between bottles versus kegs versus cans? A: Although the totals may change marginally depending on the time of year, bottles account for approximately 60%, kegs for about 30% and cans for about 10%. Q: How many batches of beer are produced in a single day? A: Currently, we can produce 5 batches a day. Q: Where is Steam Whistle sold? A: Canada’s Premium Pilsner can be found across the nation! Ontario, Alberta, British Columbia and Quebec, but some orders have been delivered to the Yukon, Northwest Territories, and Saskatchewan. Q: Why the green bottle? A: Our bottle is a replica of the industry standard beer bottle from the 1950s and pays tribute to The Golden Era. Q: Is there a difference in the color of the bottle and its protection from the sun? A: There is a minimal amount of protection difference between brown, green and clear coloured bottles (any colour of glass can let in light). At Steam Whistle, our beer is enclosed and sealed into cases to avoid exposure to light. Q: What is a Pilsner? A: A Pilsner is a type of Lager beer. Pilsner is the most popular style of beer in the world. Pilsners are generally very light in colour, from pale to golden yellow with a distinct hop aroma and flavour. Pilsner is named after the city of Pilzn in the Czech Republic, where it was developed in the 19th century. Marek our brew master is from the Czech Republic, and also worked at Pilsner Urquell before joining the Steam Whistle family. Q: How much beer is in the tanks? A: Although each tank holds just over 450 hL, they are never filled to the top because the brew requires room for foaming. 1 brew is approximately 30 hL, and each tank can hold about 12 brews (aprox. 360 hL). Q: What are the bitter and sweet smells in the brewery from? A: The aromas from the Brew House are the result of the barley and hops being boiled in natural spring water during the brewing process. The barley emits a sweet or grain-like scent, while the distinct bitter smell is attributed to the hops. Contrary to popular belief, yeast has no smell. A: At Steam Whistle, we are constantly seeking new and innovative ways to expand our market share while staying focused on brewing Canada's Premium Craft Beer. Steam Whistle has experienced exponential growth since its inception in 2000 and continues to do so. Q: Do you pasteurize your Steam Whistle Pilsner? A: We believe in staying true to the traditional Pilsner brewing process, which does not include pasteurization. (Pasteurization is a heat process used to extend shelf life of food products, but we don't like the effects heat has on the beer's taste). Instead, we use a 3 step filtration process to ensure quality and consistency in every batch of beer we brew. In addition, we diligently monitor our date codes to ensure that only the freshest Steam Whistle is being served at all times. Q: What is the best way to store Steam Whistle? A: Steam Whistle is best stored in a cold, dark space until cracked open and enjoyed. Q: Isn't Steam Whistle just a summer beer? 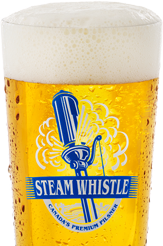 A: Steam Whistle is a great refreshing reward to be enjoyed all year round. Available in bottles, cans, and on draught, Steam Whistle is a great addition to any backyard BBQ, at the chalet after hitting the slopes, on a sunny patio, dancing in a bar, or sitting around a campfire! Q: Do you use preservatives? A: Steam Whistle Pilsner is brewed using only four of the finest, all natural ingredients: barley from Saskatchewan, hops from Germany, natural spring water from Ontario, and yeast from Hungary. Actually, there is one added ingredient...passion! Q: How do beers go skunky? A: Skunky beer refers to the smell that is emitted from beer that has been lightstruck. This occurs when beer is exposed to light for extended periods of time, causing the reaction and breakdown of molecules that contribute to the bitterness in beer derived by the hops (the smell does dissipate when poured into a glass). The best way to avoid it is to keep your beer stored in a cool, dark place and drink it soon after opening. Q: Why do they say a perfect pour should have at least 2 fingers of foam or head? 1. Foam brings out the great aromas of Steam Whistle: soft bready flavours from the malt, and grassy, straw aromas from the German hops. 2. Foam provides a barrier between the beer and oxygen, maintaining its freshness.